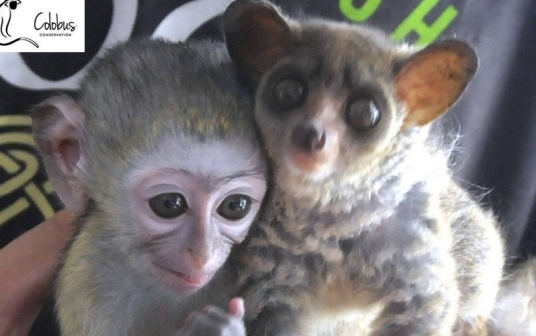 Cashew is a young bushbaby and Laila is a young vervet monkey. Cashew was sadly abandoned by his mother when he was too young to fend for himself. The reason he was left is unknown, but it is thought to be as a result of habitat disturbance in his native Kenyan forest. Laila became an orphan when her mom was killed by hunting dogs as part of Kenya’s illegal bushmeat trade. Both of these infant primates had a harrowing and traumatic start to life but, thanks to Kenyan conservation NGO, Colobus Conservation, the two are not only being provided with expert care, but have struck up the unlikeliest of friendships. 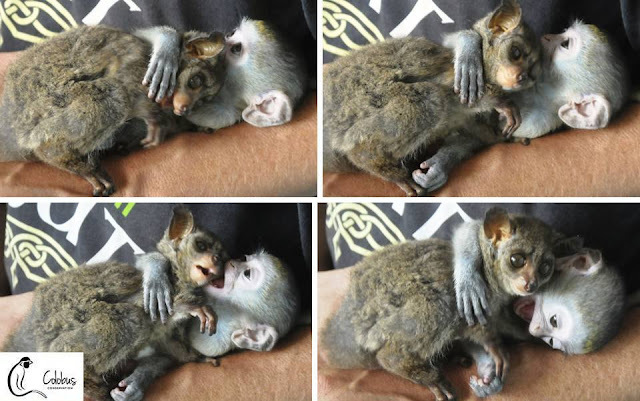 Bushbabies like Cashew are nocturnal (active at night) and vervet monkeys like Laila are diurnal (active during the day) so despite being rescued at around the same time, it was initially thought unlikely that the two of them would see much of each other. In a short video released by Colobus Conservation, the adorable orphans can be seen rough-housing and having fun; something which the staff caring for them say is not just adorable to watch, but incredibly important for their development. Responses to "2 Rescued Orphan Primates Form an Amazing Bond (VIDEO)"